When a massive star, exhausted it's nuclear fuel, ends it's life, a supernova explosion (see animation) takes place and a compact remnant is left. This object, called Neutron Star, has a radius of about 10 kilometers and rougly one and a half times the mass of the Sun (whose radius is 700.000 km). 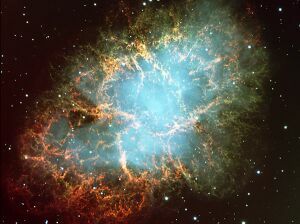 A Neutron Star hence is the cinder left when a giant star burns out and collapses on itself. Gravity overwhelms the electronic force that separates atoms from each other and crushes them into a mass ten trillion times denser than a lead brick. A single teaspoonful of neutron star material weighs as much as a mountain! Because of the angular momentum conservation, the same principle on the basis of which an ice skater spins more rapidly bringig the arms near the body (see the animation), the collapsed star, having drastically reduced its radius, borns with a extremely high rotational period. Pulsars (pulsarting radio sources) are rapidly spinning, higly magnetized Neutron Stars emitting a collimated beam of radio waves. The radio emission, arising from the magnetic poles, is beamed and, if the magnetic axis is not alligned to the rotational axis, the Neutron Star behaves as a lighthouse and an observer on the Earth sees a pulse of radio waves. The first radio pulsar was discovered in 1967 by Jocelyn Bell, a research student at the Cambridge University, and her thesis supervisor Anthony Hewish (awarded with the Nobel prize for Physics in 1974) during an experiment on the scintillation produced by the interplanetary medium on extragalactic radiosources. Discovery observations of the first pulsar. to radio interference also seen on the same plot. (b) Fast chart recording showing individual pulses. This object showed regular pulses with a repetition period of 1.337 seconds, lasting few hundredths of second. The short duration of the pulses was indicative of the fact that the emitting object should have a diameter D of some thousandth of kilometers at most (from the so called causality argument D < c x T - where c is the speed of light - that links the duration T of the signal to the size D of the source of emission). At first, because of the small inferred size and of the regularity of the pulses, the hypothesis that this could be a signal from an extraterrestrial integlligence was taken into account and the first pulsar was nicknamed LGM1 (for Little Green Man 1). Very soon professor Hewish and miss Bell understood that this couldn't be an artificial signal, first of all because three more similar recordings were found in different positions of the sky and secondly because there was no evidence of an orbital motion of the emitting object which would have been seen if it was a message sent from an extraterrestrial planet orbiting it's sun. 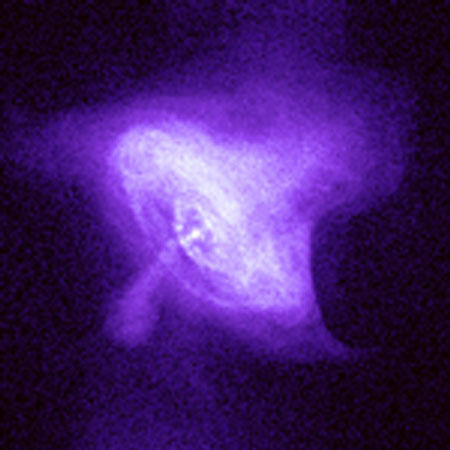 (3) The radio pulse profile of the Crab pulsar. The attention then moved to small size stellar object: white dwarfs, whose radius is about few hundredths of kilometers, or neutron stars, whose existence was postulated since 1932 but never observationally verified. The ultimate evidence that pulsars were indeed neutron stars came from the discovery, a year later, of the pulsar in the Crab Nebula, a supernova remnant that Franco Pacini, in 1967 (before the Bell & Hewish discovery) theorized that could be powered by a rotating magnetized neutron star! Also, the short period of the Crab pulsar (only 33 milliseconds) ruled out the white dwarf hypothesis: at this rotational speed an object such that would be disrupted by the centrifugal force overwhelming the gravity.